Degas was an 'abonné,' a male patron who paid a subscription fee to go behind the scenes and into the dressing rooms of the dancers at the opera. Edgar Degas predicted that dance moms in any century would be a bad idea. It wasn’t Degas’ anti-Semitic and hermetic attitude that barred him (pun intended) from painting this scene of young girls from life. The rehearsal space in the Salle Le Peletier Opera house no longer existed when he painted it in 1874 having burned in 1872 due to its “advanced” gaslight system. The piece was commissioned after the fire by Opera star Jean-Baptiste Faure whose famous role in Rossini’s Guillaume Tell is referenced by the poster on the wall. Luckily for these young women in tutus and their bored gossipy mothers our instructor is not the villainous Abby Lee of Dance Moms but acclaimed dancer Jules M. Perrot. He is seen standing in profile, which is probably best since he was once described by famed instructor Vestris as “not handsome, [and] extremely ugly.” Vestris went so far as to instruct Perrot to "jump from place to place, but never give the public time to study your person." Bequeathed to the Met by Mr. and Mrs. Harry Payne Bingham. Harry was the nephew of Oliver Hazard Payne, a man whose name may be familiar due to his heavy involvement in U.S. Steel, Standard Oil, and the American Tobacco Trust. Ol’ Oliver also tried to bribe government officials to get his family members high-ranking jobs. The guy was loaded and left a bunch of money to already rich little Harry. The Dance Class is an 1874 painting by Edgar Degas. It is in the collection of the Metropolitan Museum of Art. The painting and its companion work in the Musée d'Orsay, Paris are amongst the most ambitious works by Degas on the theme of ballet. The imaginary scene depicts a dance class being held under the supervision of Jules Perrot, a famous ballet master, in the old Paris Opera, which had actually burnt down the previous year. The poster on the wall for Rossini’s Guillaume Tell is a tribute to the operatic singer Jean-Baptiste Faure, who had commissioned the work. The picture is on view in the Met Museum's Gallery 815. 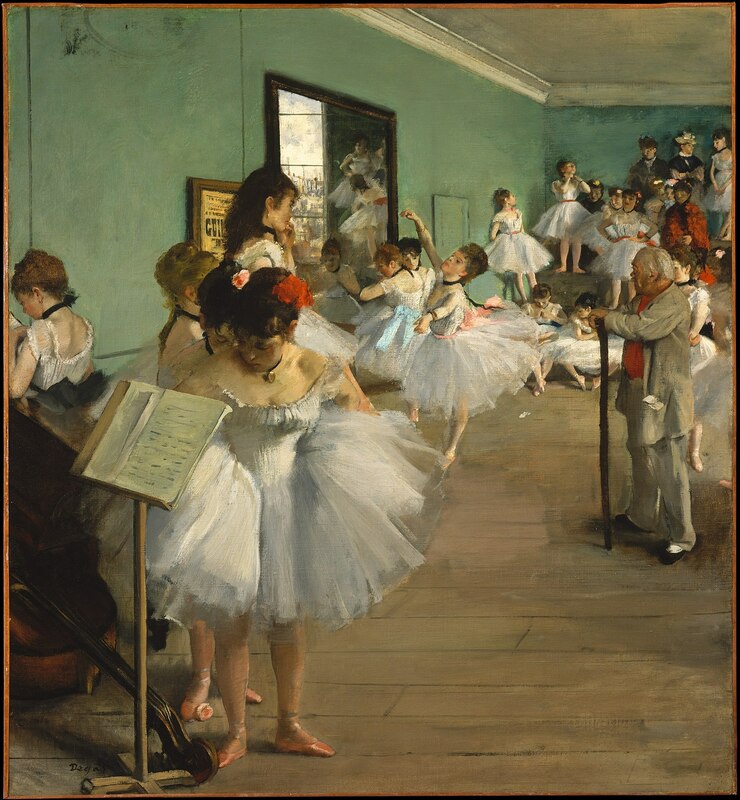 Check out the full Wikipedia article about The Dance Class (Degas, Metropolitan Museum of Art).